I had always seen lots of advertising for Canvas Prints, but I had never tried them. After ordering my first canvas print, I am now hooked! They are such high quality and absolutely gorgeous! 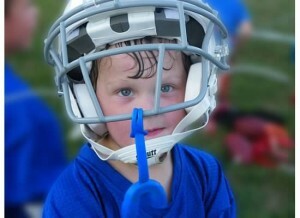 I thought the above picture of my son in his football helmet and jersey would be perfect for this. I used my photoshop skills to blur the background to make my son really stand out. I went to http://www.easycanvasprints.com/, uploaded the image and was quickly able to order the size I wanted. It was so easy! The color is absolutely gorgeous. The image below does not do it justice. If you watch the video you can really see the quality of the canvas when the Bandit holds it against his blue walls in his rooms. It arrived within a few days and is already made for easy mounting on the wall. I will definitely be ordering more of these to have some of my favorite pictures displayed. Watch the Bandit below show you his new canvas print. He absolutely adores it 🙂 Then go to the form below to enter to win your very own 8 x 10 canvas print! 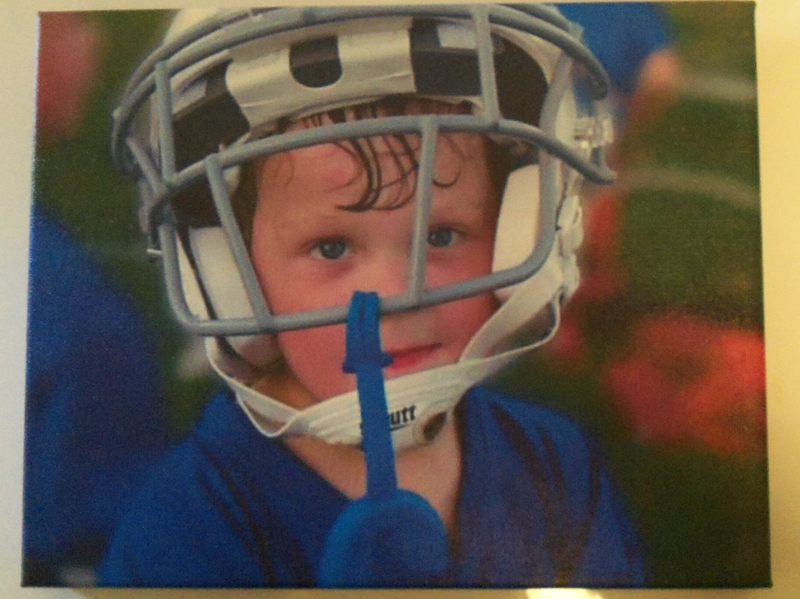 Enter to win an 8 x 10 Canvas Print from EasyCanvasPrints.com! Open to the continental US (excludes Hawaii and Alaska – sorry folks! ), 18 years of age and older. Giveaway ends July 2, 2012 at 11:59 pm EST. Good luck! Giveaway Bandit contains endorsements for products and services, which means when you click on a link that I recommend, I may receive a commission. Not every link is an affiliate link. We received an 8 x 10 Canvas Print from EasyCanvasPrints.com in exchange for this review, but all thoughts are our own. « Ready to Transform Your Body and Change Your Life? Love that you can order different sizes! Love you can use your own images. I like that they have different designing & pricing options! I like that the canvas is supposed to be a “work of art” and should last for decades. I like the variety of frame & wrap options. I like all the different size options! I love the variety of sizes offered, plus the framing options. I like the wide variety of options. I learned there are many different canvas sizes. I like that you can buy art canvas prints also, I like the Asian ones. I like the Wood Float Frame and the Color Wrap. Have never seen color wrap before. It is unusual and creative. We own several canvas prints, All are Better than Any Picture we have up on our walls! But a Free one! Thats even better! I love that you can use your own pictures to create a large canvas for your home. I found out that they are very affordable. The pictures are so bright. I really liked all the different sizes they have. I like that you can upload pictures from Instagram! Such a neat feature – everyone is linked to Facebook, but I haven’t seen many Instagram linked printing sites. I learned that the canvas should last for decades if properly cared for. I like how they have different framing & wrapping options.